Picosecond acoustic pulses are tiny in extent, typically less than 0.1 μm long. Because of this, until now we have not been able to measure their shape as they move. Here we present a tomographic method for recording a longitudinal picosecond acoustic pulse as it travels through a transparent solid. We use a specially shaped sample in the form of a 10 mm diameter glass hemisphere, with the flat surface thinly coated with gold. 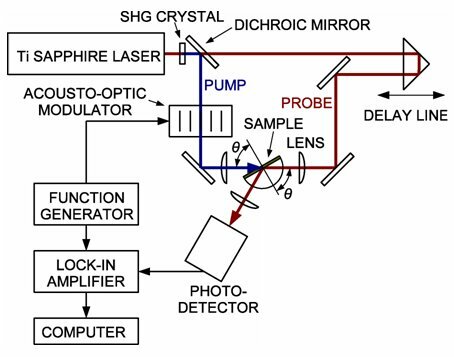 Picosecond acoustic pulses generated by blue laser pulses in the gold then travel into the glass, where we detect them with red laser pulses. See the figure. By rotating the hemisphere and making measurements at different angles we build up a databank of results that can be analysed by a computer algorithm. 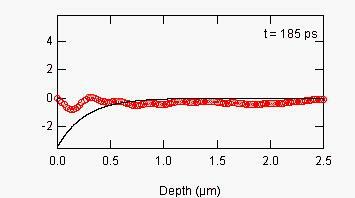 The result is that we can extract the shape of the acoustic pulse as it moves through the glass. See the animation below. Click the image to see a 300 kB animation of the picosecond acoustic pulse in the glass. The frequency of this acoustic pulse is about 10 GHz. If you look carefully, you can also make out a second, smaller acoustic pulse later in the animation. This is an acoustic echo from the front surface of the glass hemisphere. We have also produced a theoretical animation, corresponding to a perfect experiment. 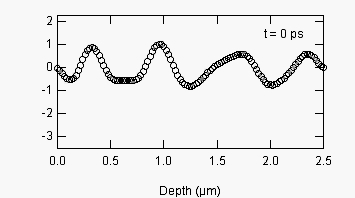 Click the image to see a tomographically-produced animation of the picosecond acoustic pulse (red curve) in the glass, using artificially produced data. The black curve is the actual strain pulse shape used. This method should prove useful for understanding the shape of picosecond acoustic pulses and how they change when travelling. We hope that we can ultimately follow even shorter acoustic pulses by the use of shorter optical wavelengths. For more details see 'Tomographic reconstruction of picosecond acoustic strain propagation,' M. Tomoda, O. Matsuda, O. B. Wright and R. Li Voti, Appl. Phys. Lett. 90, 041114 (2007).